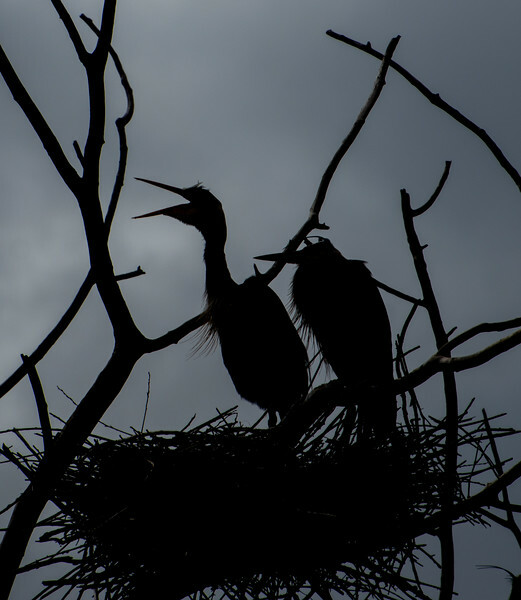 A rookery is a colony of breeding birds. Often these are man-made, and these can look like the exposed superstructure of a huge sunken pirate ship, teeming with herons, cormorants and egrets. Others are natural collections of large nests at the top of tall trees, attracting the same types of birds. 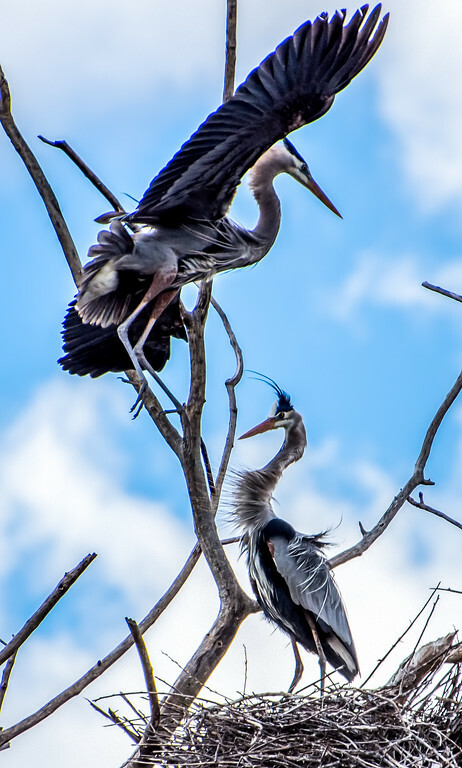 I like the natural rookeries much more, and on March 20, 2016, I took some photos of Great Blue Herons at a natural “heronry” in the Danada Forest Preserve in Wheaton, Illinois. There were about 12-15 nests at the time, every one in use. Great Blue Herons are incredibly impressive birds. They really seem almost prehistoric, especially when they emit their surprisingly guttural calls. These can be very loud, and in a twilight setting they can be eerily haunting. 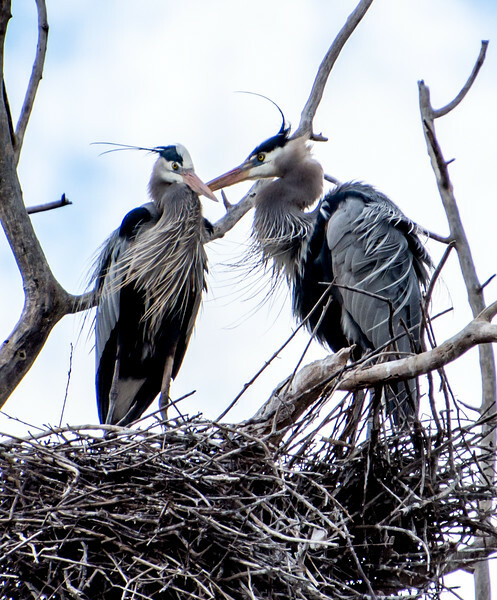 Per the Cornell site, the male collects the sticks for the nest that is usually high in a tree, while the female weaves a platform and nest cup, the whole project taking up to three weeks to complete. The clutch consists of 2-6 eggs with an incubation period of 27-29 days. From what I have observed, I would say that both genders are very attentive parents. By the way, those feathers on their chest, called powder down, continually grow and fray away. They comb these feathers with a fringed claw on their middle toes, removing fish slime and oils from their other feathers as they preen (“like a washcloth,” as Cornell puts it). And did I mention they can look prehistoric? Marvellous shots. The reserve I frequent has several herons over the spring, summer. I’ve never seen where they nest though. Thank you, Belinda! I was looking at your blog and your photographs are really outstanding. I was thinking of writing a dragonfly/damselfly post next, and I see that you have photographs of those as well! Wow, your bird count just went up 50% overnight! Very sharp pictures. I like the first two a lot – probably leaning to their first one as my favorite due to the high contrast and deep color against the cloudy sky. These natural rookeries appear similar to what the Wood Storks were hanging out in when we went to Georgia (they allowed the Egrets, Herons and Anhingas to share their nesting area which I found interesting. Next time I’m in the area you will have to show me where these are. Thanks! Actually, I worried that the first photo looked too contrasty, so I’m glad you liked it. There’s a few rookeries around here, but this one is my favorite because it’s a natural one. For some reason, this is a heron-only rookery. It’s just astonishing that birds this large can nest way up in trees. From what I hear, there used to be even more nests up in the trees before a big storm came through a few years ago. Thanks again, it took me forever to glue those little pieces in place. Thanks! This blog is not nearly up to my brother’s standards that you mention at http://www.wildlifeintrigued.com , plus I’ve been very negligent on posting. But we’ll see, I’m planning on posting more soon! Great images Ron, any sibling rivalry? Hi Brian, nice to meet you over on my vastly neglected blog after reading your comments on my brother’s vastly active blog!! I laughed when I read your question on sibling rivalry. We joke about it, but there’s no rivalry at all. We go birding together and review bird pics to identify the tough ones, and we are happy when each other finds new birds or takes awesome shots of repeat birds. It’s a lot of fun. As I mentioned, I haven’t posted here in a long time. Maybe this will get me jump started again. This blog is for bird pictures only, but if you’re interested in my pics of Australia and Fiji, have a look at https://www.rondoerflerphotography.com/ . Thanks again for your comment! I’ll be following your blog. Yes I guessed you and Brian worked as a team, it’s always nice to have someone to help with tricky id’s. It’s not the quantity of posts but quality that counts. I try to do one a week but that’s all weather related. The butterflies and dragonflies are nearly finished and there is only one more drag race, that’s when I turn to birds, a lot trickier for me to photograph.